A beautiful sculpture of Sacajawea graces the campus of Lewis and Clark Community College in Godfrey, Illinois. The piece was crafted by sculptor Glenna Goodacre who also designed the image on the Sacagawea $1 coin. 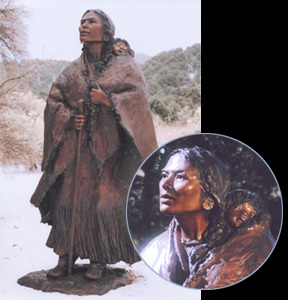 Shoshone woman Randy’L He-Dow Teton modeled for both the sculpture and the US MINT Sacagawea coin.